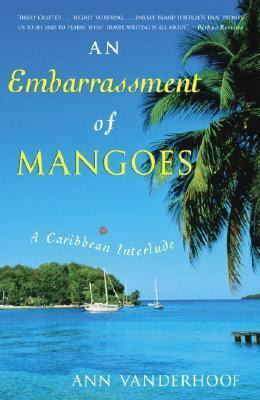 This month the Dwight Foster Public Library Book Discussion group savored An Embarrassment of Mangoes by Ann Vanderhoof. The book was a hit! It combines two of my favorite things; traveling and cooking. This is the perfect combination to take one away from the Midwest Winter doldrums. The author and her husband Steve Manley bravely depart from their home in Toronto, Canada by sail boat to travel to Trinidad, stopping at 47 Islands along the way. What an amazing two-year journey for them, both in terms of miles and changes in life style. Alone the thought of leaving the predictable 9 to 5 routine to being dependent upon the weather…hurricane season and all is frightening to most mid 40 year olds. But these two put aside their reservations and went for it. Ann is a wonderful writer. The reader gets a real feel for the people, the cultures and the wonderful food they encountered on their travels. The book includes many mouth-watering recipes including: Pina Colada Cheese Cake, Mango Crisp and Coconut Brownies. I brought a few samples in for the discussion group to sample and they were delicious. The Low Country Shrimp and Grits I’m saving to serve at home. Check it out! You too can travel vicariously with Ann and Steve to the Islands. I think I hear those steel drums now.